I took the camera along today to take some shots around the city of the copious amounts of snow that continue to fall on us daily. The one at left is down by the bayfront. The wind was blowing hard off the bay, creating blizzard-like conditions. Today (Friday), we had yet another unexpected dumping of snow (it was lake effect from a frozen lake...go figure!). Here is where our statistics lie as of midnight on Saturday, January 31. January total so far: 59.2"
This is our 3rd snowiest January ever. 2nd snowiest is January 2004 with 59.9". The snowiest January on record is 62.4" set in 1978. Will we break the record for January? Probably not...but we may very well break into the #2 spot by midnight tomorrow. Snow so far this winter: 129.5"
This number earns us the #5 spot for snowiest winters in Erie history. We now need less than 20 inches to break the all-time record. Will we do it? I'm not really that worried...after all, we received 1/4 of that amount in four hours today. In fact, I'd be willing to bet that by the time this seemingly Narnian winter ends, we will not only break the all-time record...we will SHATTER it! I leave you with some more pics from around town today. It was truly a whiteout at times with horrible driving conditions. And yes, I was taking pictures as I was driving. So sue me. 1. Along the bayfront highway. Couldn't see a thing. The most recent DGEX model (forecasters use several models to predict weather and make their forecasts. DGEX, which is an acronym for Downscaled GFS with ETA Extension, is one of them) pumped out some incredible snow amounts with this storm next week. If one were to believe this model, Erie sits --yet again-- in the bulls eye. Take a look at the key...and you'll see that cities like Erie, Buffalo, and Rochester sit in the line of >18" snow amounts. In addition to the snow, winds with this thing are expected to be extremely strong. So...add in AT LEAST 18" of snow, 40-50mph winds, and...well, you get the picture. I'm still not gonna say the "B" word yet...but it's getting close. Holy crap...this is really exciting! 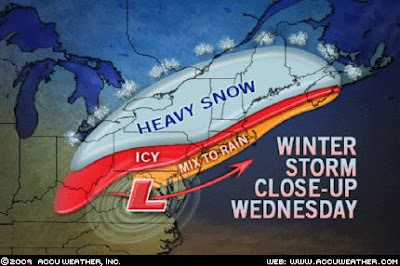 Courtesy of AccuWeather.com, here is the first graphic issued for the big storm coming our way next week. If the weather discussions are correct in what they are seeing on the models, we could be looking at a monster storm here early next week. "Crippling", if you will. Stay tuned. <-- This is what I've been doing pretty much every day since early November. 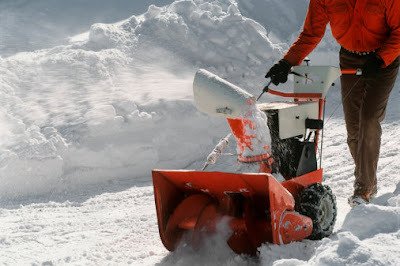 Thank goodness for snow blowers. That's all I have to say. Well, the storm last night and today has come and gone. With the 1.4" yesterday and 10.1" so far today, that has propelled this January to an unbelievable 52.3", which -- with three days to go-- officially makes this January the 5th snowiest in history. Also, just so you can say that you heard it here first....some computer models are becoming increasingly confident that a massive storm is going to hit the Eastern United States early next week. There are several possible scenarios, but the most likely one at this point looks to be yet another huge storm for Erie -- possibly making today's storm look like a flurry in comparison. In fact, Henry, my favorite weather guy over at AccuWeather, is already throwing the "B" word out. A blizzard on my birthday next week? Now that would be swell. Finally, I'd just like to point out that those older folks who use the tired, worn out phrase "the winters just aren't what they used to be"....I mean, I'm sorry -- and I certainly mean no disrespect -- but you obviously have no idea what you are talking about. I love this epic winter. May it never end! This is Pastor John Piper speaking last weekend in response to President Obama's heartbreakingly disappointing actions last week on the 36th anniversary of Roe v. Wade. Yet another winter storm is bearing down on Erie beginning late tonight and is expected to last through much of Wednesday. Although it could drop as much as a foot of new snow on us, the storm itself isn't going to be one for the record books -- but it will certainly put this winter into the record books. In fact, any snow from here on out will be part of some sort of record for us here in Erie. Where do we stand? So far this winter, 112" of snow has fallen in Erie (or at least at the airport where the official measurements are taken). So far in January alone, we have received 41.5". Where does this stand historically? So, that means that this winter, with 112 inches, is less than four inches away from getting into the top ten list. 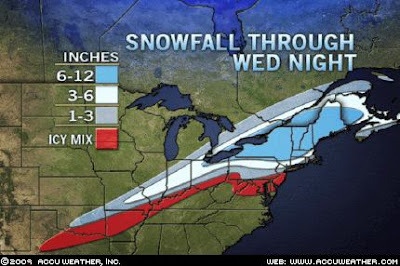 With up to 12" forecasted for tonight and tomorrow, we could easily be in the #7 spot by midnight tomorrow night. And with February, March, and April to go, I would think that the all-time record may be in jeopardy. However, with the lake completely frozen now, lake effect has essentially been shut off. We have to rely on storms like the one we are going to get tomorrow. With only five days left in the month, it will seem pretty tough to break the all-time snowiest January on record, but I would imagine we'd climb to at least #5 on the list. 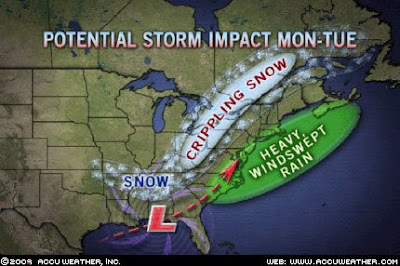 As our next storm inches closer to us, I have noticed that the weather guys keep increasing our expected snow amounts. I love when that happens! 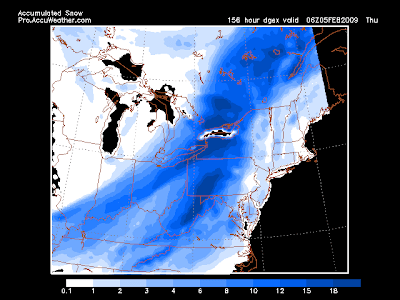 What was originally expected to miss Erie completely is now expected to put Erie in the path of heaviest snowfall. 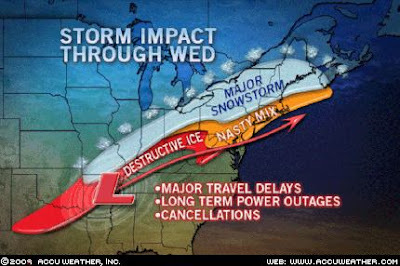 So, I feel sad for those in southern PA and the Virginia's who wanted snow. Now they're just going to have a nasty icestorm. I promised myself that I wouldn't get overly political on my new blog...but man...today was a doozy of a day and I just HAVE to talk about some of it. Seriously? This is how they chose to celebrate the inauguration of a new president? This is downright pathetic. And in other political news...Obama has signed an executive order to close down Gitmo. That, in and of itself, is a very controversial move. That aside, though, the obvious question then becomes: what does Obama suggest we do with all the detainees? Well, our favorite Congressman from Southwest PA, Jack Murtha, has signaled that the Gitmo detainees will be welcomed with open arms to western Pennsylvania. He says that we "could use the jobs a new prison would create". In addition, a new prison would provide a "round-the-clock operation". I'm sorry, but can somebody tell me how this bafoon keeps getting reelected? Seriously. Anyone? It's only Day 2 of the new administration and I already find myself counting down the days until 2012*. I saw this video this morning on Facebook...and had to respost it. I love this band...and their amazing creativity only helps me love them more. I was really sick on Sunday. I mean, REALLY sick. Thankfully, it was just some 24 hour bug. I was fine on Monday when I woke up. Then last night, Danielle started feeling the same thing. Hopefully, it will be as quick for her as it was for me. I can't bear to see her sick. I feel terrible that I gave it to her. Tonight, my guys' group wraps up our book that we've been reading. It's been an extremely rewarding time for me...and a time that has led to some changes in my life. Even more amazing however, is to see how the lives of some of the others have changed as well. God has truly been at work in our little group. I am excited to see what all ends up happening as a result of this. Next week, we are having our "Iron Chef America" dinner by Chef Seth! I am pretty sure that - even though we have finished our book - the group consensus is that we would love to continue meeting. Hopefully you're up to the challenge, Pastor Mike! As I said in my previous entry, I've been fixated on Romans 8. I have read it every day over the past week and have decided to memorize it. I am excited about some decisions that have been made. Unfortunately, I am not ready to divulge them on here! Finally, I know you're wondering what my thoughts are regarding what happened yesterday. Well, it was no doubt a day that will go down as a pivotal moment in our nation's history; one that our country should be extremely proud of. That much is true. And for the sake of our country, I certainly wish him well. That's it. regarded as sheep to be slaughtered." Last Sunday at church, the band sang "How He Loves Us". Upon the conclusion of the song, Derek read some Scripture, including some of the above passage. In that moment, I broke. I'm not sure what it was, but I just broke. I haven't been able to let that moment go all week. Then, at my Wednesday night guys' group, I opened up to them about some stuff. They said, "you've gotta be in the Word". But today, I opened up the Bible today and read. And I read. And I read. Today ended up being a not-so-typical day. Hey Obama & Co: Are you hearing this?? CNN recently ran a piece by Lou Dobbs suggesting that there is a growing body of evidence that the earth is actually cooling, not warming. CNN is the last place I ever thought I'd see a story questioning the supposed settled science of "climate change". Good for Lou, and good for CNN for allowing this piece to air. It would do well for President Obama and his team to research both sides of the issue before they go and legislate us all into green oblivion. Also, I've posted this before, but I think it's hilarious. The Warm List: things caused by global warming. Obama: Elected by the "media"? Look, I don't mean to start controversy...but anyone who didn't have their head in the sand during the last election cycle knows that the media was dangerously biased and slanted towards Obama. Trust me: biased and slanted are the two kindest words I could come up with to describe what I think was the absolute most outrageous and vicious reporting to ever occur during an election year. Imagine my delight this morning when I discovered that a documentary was in the works highlighting how the media, in so many ways, allowed Obama to win the election (nor would they stop at anything to make sure it happened like that). Media Malpractice will hopefully shed some light on the 2008 election cycle and why 2008 truly was the year that the media died in the United States of America. Here's a quick excerpt featuring the filmmaker's interview with Sarah Palin (and here's what he had to say about it...a very interesting read). I love what she says about Katie Couric! Danielle and I are spending a few days up in Minnesota with Aber and Molly. As is usually the case with this particular friend group, my love of all things Howard Johnson's has been discussed several times. I enjoy it, even though I get laughed at. It's okay, though: I'm used to it.